The Boxing fighter is driven by two independent gearboxes. Each gearbox transfers movement to both its associated foot and arm via crank plate and linkage rod, causing the arm to punch as the foot propels the unit. Each gearbox is controlled by a corresponding lever on the two-channel remote control, which means you can move your fighter forwards or backwards while turning to the left or the right. In no time you will be able to make your boxing fighter go anywhere you want. Through a simple adjustment of the elbow linkage rod, the type of punch can be changed from an upper cut to a straight jab. By adjusting one arm for upper cuts and one for straight jabs, you can achieve a combination of the two attacks for more tactical fights. You can also adjust the stability of each fighter, making it easier or harder for your fighter to be knocked down. If the fighter gets hit in his mouth, his judging plate drops to indicate that he has lost the match. The fighter’s body is made from a transparent blue ABS resin that allows you to see all of the motors, gears, cranks, and linkage rods in action. Gearbox, motor, and remote-control are included. Motor and electronic circuit come pre-wired. Kit also comes with practice punch ball. A screwdriver for assembly is provided. Requires two AA (a.k.a. R6 or UM3) batteries (sold separately). 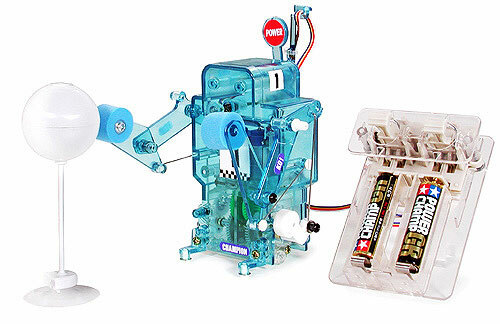 Build a course that the robot should follow in order to reach the target that has to be hit. Create a ring with a board or a tile and defeat your opponent by punching them out of the ring. Make walls with various blocks and try to destroy them with the boxing fighter as fast as possible. Note: This is a kit. Assembly requires using a screwdriver and snapping parts together. No soldering is required. Run on flat, smooth surfaces; avoid running over slopes, on bumpy roads, or on thick carpet.